You might not know what a PicoSure laser tattoo removal “pulse count” is but let me tell you, it’s critical to the removal process. 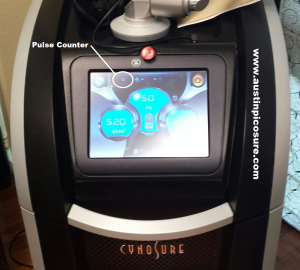 The pulse count is the total number of times the PicoSure laser fires or pulses during a treatment. The factors affecting the pulse count are (1) the rep-rate or Hertz, which is the number of times the PicoSure laser fires per second and (2) the speed at which the operator covers the ink. If the rep-rate is firing at 10 times per second and the operator is moving the laser over the tattoo slowly, the total pulse count will be quite high. If, on the other hand, the operator has the rep-rate set too low for the area being treated and he or she moves the laser too quickly, then the total pulse count will be too low for an effective treatment. So what does this mean? Well, every tattoo will require a certain number of pulses for the ink to be vaporized. If not enough pulses-per-treatment are applied, then the tattoo will not come off quickly and the number of treatments required will go up. I base the rep-rate (Hertz) and speed of coverage on a number of factors including location, color, size, ink reaction and more. I’ve developed this strategy over the 3 years since the introduction of the PicoSure laser and let me tell you, it’s extremely effective. I recently observed a tattoo treatment with a POS Q-switched laser and not to knock another operator, but the session was a total failure. The operator, who was neither an MD nor an RN had the rep-rate set way too low and she passed over the treatment area much too quickly. The result? An ineffective treatment fail. Unfortunately, the market is saturated with low-quality “Tattoo removal clinics” using POS Q-switched Lasers operated by non-professionals who lack the skill, education and experience to remove a complex tattoo. If you have a tattoo you would like to safely, effectively and COMPLETELY clear with the revolutionary PicoSure laser I can be reached by phone @ 512-479-9997 or just stop by my NEW location in Austin, TX: Austin Medspa on W. 6th St.